The National Inland Waterways Authority (NIWA) has threatened to ban activities of speed boats also known as ‘flying coffins’ over series of accidents on Lagos waterways. The General Manager, Lagos Area Office of NIWA, Engr. Muazu Sambo, disclosed this at a stakeholders’ meeting with boat users -United Waterways Passengers Association (UWPA) and boat operators under the aegis of Association of Tourist Boat Operators and Water Transportation of Nigeria (ATBOWATON). 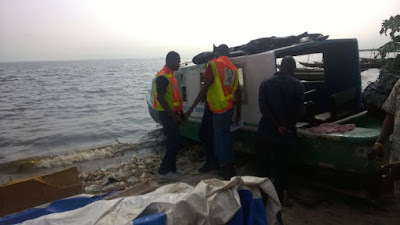 It would be recalled that five people died in a boat accident in Lagos last week Wednesday at about 5.57 pm when a boat capsized mid-sea on its way to Ikorodu from Lagos Island. It was also gathered that an unclaimed corpse is still lying at the morgue because the identity of the corpse remained unknown. Sambo who bemoaned incessant deaths recorded on the Lagos waterways, also lamented lack of standard fibre boats on the Lagos inland waterways said the authority had given operators enough time to standardise their operations which they failed to do. He said, “As far as I am the area manager of Lagos Office, flying coffins won’t operate again. In 2016, we gave them enough time to standardise their operations by giving them opportunities to seek loans but they have refused.” Speaking on issue of educating and enlightenment of passengers, the GM said they would be trained on enforcing standards on the inland waterways. Sambo also identified wrecks, logs and fishermen as obstacle of safe navigation on the Lagos Inland Waterways. Speaking, chairman of UWPA, Pius Agbude lamented over-loading by boat operators including faulty designs of their boats.